Young Playwrights’ Theater is proud to premiere our new documentary! 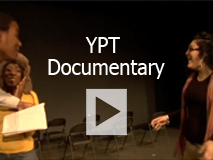 This film captures the magic that occurs in YPT workshops, and the thrill of YPT performances. You can hear directly from YPT staff, teaching artists, actors and students whose lives have been changed by learning to express themselves clearly and creatively through the art of playwriting. It was created by filmmaker Ken Chalk over a year of filming throughout the DC Area. At just under ten minutes long, it is an ideal way to share the magic of YPT with your friends and family. Watch the video and then forward it to a friend, colleague or potential playwright. Help us spread the message to the next generation of playwrights!